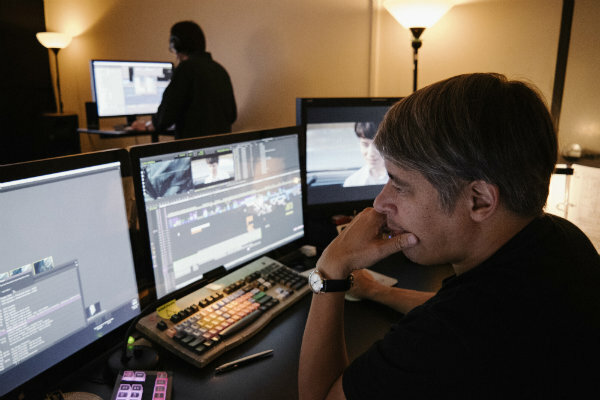 Tom Cross, ACE, in the edit room for "First Man"
The first time he cut a feature--Whiplash--for director Damien Chazelle, Tom Cross, ACE wound up winning the Best Editing Oscar. The second film on which they collaborated, La La Land, yielded another Oscar nomination for the editor. And now Cross has again teamed with Chazelle, this time on First Man (Universal Pictures) which is now squarely in the awards season conversation. Cross’ collaborative history with Chazelle actually goes back to the short film Whiplash (a Sundance Award winner), which spawned the feature of the same title. The feature-length Whiplash went on to win not only the Best Editing Oscar for Cross but also two other Academy Awards, Best Supporting Actor for J.K. Simmons, and Best Sound Mixing for Craig Mann, Ben Wilkins and Thomas Curley. Cross has also made his mark on other films beyond those with Chazelle. Cross was one of the editors on Joy for director David O. Russell. And Cross also has a collaborative pedigree with writer/director Scott Cooper, serving as an additional editor on Crazy Heart (which won two Academy Awards, including Best Leading Actor for Jeff Bridges) and then reuniting to cut last year’s release, Hostiles. SHOOT caught up with Cross who shared insights into First Man. SHOOT: Besides the opportunity to again team with Damien Chazelle, what drew you to First Man? Cross: As a movie lover, I loved the outer space genre since I was a kid. It’s special to me as is that time period, the 1960s. Damien wanted to tell this story in a different way. We’re both big fans of Kubrick’s 2001: A Space Odyssey. But we weren’t going in that direction. 2001 is totally space age, clean, antiseptic, science, mathematical. Damien instead wanted to tell a personal story--Neil Armstrong’s personal story while also wanting the audience to experience a space launch, like being a documentary cameraman strapped into the seat of the Gemini capsule, the Apollo capsule. That’s where the cinema verite style kicks in. There was also no green screen in this movie. Damien wanted it to be as real as possible. I always had something in camera to work with, which was a real pleasure for me in terms of telling a story. Through this authenticity, we were able to get into Neil’s head, experience through his point of view. When he climbs into the capsule, it’s as if the audience is climbing in. SHOOT: What was (were) the biggest creative challenge(s) that First Man posed to you as an editor? Cross: The moon and the kitchen--that’s the most important balance as defined by Damien. The moon scenes that took us on the missions had to have an immersive, almost VR feel, helping viewers to experience what it was like to take off in one of those rockets. We wanted those scenes to be violent and scary. But we balanced that bigger than life experience with something intimate--Armstrong’s family life in the kitchen, the domestic stuff back on Earth. And logistically there was the challenge of dealing with over 1.7 million feet of film. It took a full editorial team effort to organize all of this. Ryan Chavez, a great visual effects editor, helped organize and put scenes together. John To (an additional editor) used to be my first assistant. He contributed greatly to the work as did (additional editor) Harry Yoon. When you embark on a cinematic journey that is supposed to play on a large canvas, it really matters who your team is. You really need an amazing team of editors to get this up on the screen, especially when you’re approaching 2 million feet of film. It takes a village to accomplish this. SHOOT: You also have a track record with cinematographer Linus Sandgren, FSF, who shot both La La Land and First Man. How did you two collaborate on First Man? Cross: We have a working shorthand because we had worked together before. We didn’t have to worry about stepping on each other’s toes. It was all about advancing the story. Almost every day, I’d get an amazing piece of footage--from incredible stunt work to cinema verite family stuff, boys playing around the house. In some cases, it was documentary-esque footage. There were two weeks of rehearsals with the two boys playing the sons of Neil and Janet (Armstrong, portrayed by Ryan Gosling and Claire Foy). They played house and played family so that they would become comfortable with each other and the cameras. It was completely unscripted and we used a lot of it for the domestic family stuff in the final film. SHOOT: What was your biggest takeaway or lessons learned from your experience on First Man? Cross: I learned something I really had no idea of before--how dangerous these missions were and how much the astronauts put their lives at risk, how painful these journeys were. The characters became that much more heroic to me. We showed what these astronauts went through on these dangerous missions--and their families were invariably along for the ride. I also felt a clumsy parallel. While what we do in filmmaking isn’t life threatening, we work long days, long, hard hours. We take our families along on these journeys even if we know it or not. When I look at Neil and his family, I saw my own life and children in a way I hadn’t before. Families make sacrifices so that we can do this work. At the end of the day, I’m so happy about what we accomplished with our team. It was a profoundly moving experience in a lot of different ways.